I have still problems with multispecs. It just doesn't (always) load bindings. until i do /reload or change zones with my character. I have the option for clique to trigger bindings on the down portion of click, however, this is not applying to global binds. I am not sure if this is because Blizzard took out the option to have binds trigger on down stroke. Am I doing something wrong or is this a known issue? So far my friend/enemy are working as intended by triggering on down portion just not the global ones. I guess I am experiencing same issue with hover binds. This issue for me seems fairly recent maybe with the last update? Thanks, I downloaded the file but I've removed the comment. Yes, I should be able to look at it tonight but it's probably a few days from being "fixed". I know you just recently sent an update about nameplates but is a pri/sec talent fix in the works? Every spec is viewed as primary spec. Thanks for the support thus far! This is an amazing addon! For whatever reason the latest version of Clique causes Pitbull to not load. Reverting back to the last version until this is fixed. Hello! Was just curious if there are any plans to update clique to deprecate the dual spec options and allow a profile for each spec now that specs are no longer restricted? First of all, I'd like to thank you for all the time and effort you've put into this addon. It's a lifesaver. I do have a question and, possibly, a request. Back in WOTLK, I was using Clique with TidyPlates as a tank, and I was able to click mob nameplates to cast a spell. It was a huge thing for me, as I could taunt a mob in a split second, and do other things with it. I am now running KUI Nameplates, and try as I may, I don't seem to be able to replicate the same. Is it possible in some way to get the click-cast work on nameplates? Possible for update soon? Having lagspikes when I enter combat while using clique and other raidframe addons together, its annoying :( 1 sec lag spike on boss pulls screw my burst up alot. I tried several raid frame addons, i get this spikes everytime I activate clique while raid frame addon is active. Seconding this, in hopes of potential fix. Same issue. Have had it since 6.0, as well. 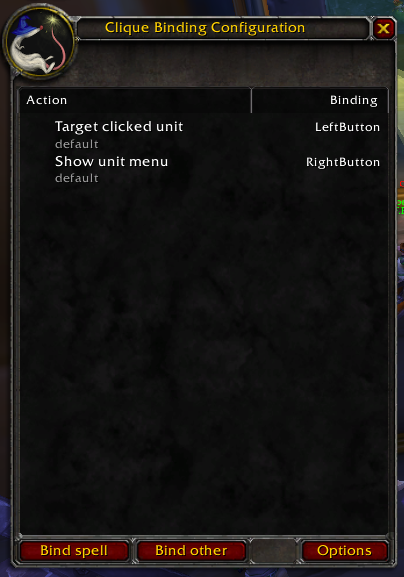 Ever since 6.0 version, the down click portion isn't working, unless you check/uncheck any option from the addon's interface. Thing that you have to do everytime after you log in and out or reload your UI. It happens with all unit frames, either default ones or 3rd party. Hey! I wanted to say that I love love love love this addon! it makes healing so much easier and is a 100000x better than healbot. I hope that you update it for 6.1. Thanks for all that you do! Will this be updated anytime soon? Im LOST without it! Thank you in advance for all the time you put into this. "GetActiveTalentGroup" is not found in .lua file. However, "GetActiveSpecGroup" is...So, with this file you said to change, and its already current. Any other ideas? I believe Cladhaire has said that the current beta version of Clique works with patch 5.0. You may need to change your addon settings to enable you to download the beta version. replace all (two) instances of "GetActiveTalentGroup" with "GetActiveSpecGroup"
This change has been working for me so far. Looking forward to the 5.0.4 update - I love using Clique with Grid2! I feel like I've lost a limb without it. Would you please update this for 5.0.4? My game is incomplete without it! PLEASE update for Mists of Pandaria Beta. I really hate healing without this. Edit: I see now on WoWInterface you did, I just had to check Other Files. Now I feel silly.